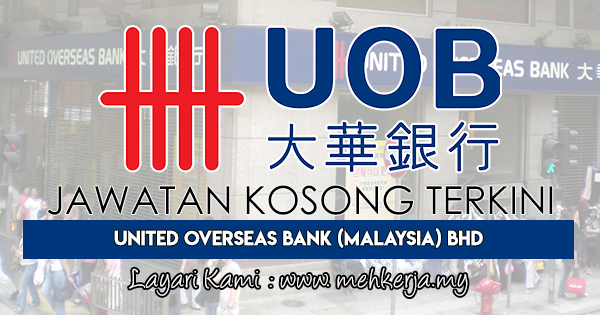 UOB (Malaysia), a subsidiary of United Overseas Bank Limited ("UOB"), was incorporated in 1993. UOB (Malaysia) took over the Malaysian operations of Lee Wah Bank Limited ("LWB") in 1994. LWB was incorporated in Singapore in 1920 and opened its first Malaysian branch in 1956. In 1973, LWB became a wholly-owned subsidiary of UOB. On 7 Jun 1997, UOB (Malaysia) merged with Chung Khiaw Bank (Malaysia) Bhd("CKBM"). UOB (Malaysia) and Overseas Union Bank (Malaysia) Berhad merged into one legal entity on 2 Feb 2002. Today, UOB (Malaysia) operates 45 branches throughout Malaysia, making it the foreign bank with the largest branch network in the country. 0 Response to "Jawatan Kosong Terkini di United Overseas Bank (M) - 16 Sept 2018"